RESPECTED Japanese academic Masakazu Sugiyama's dream of sending ships full of cheap, reliable hydrogen from Gladstone to Japan is growing stronger. 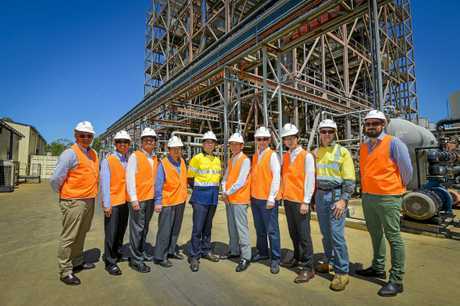 The University of Tokyo professor was among a delegation of Japanese industry leaders in Gladstone yesterday to explore ways the Port City could help the country showcase hydrogen as a fuel source at the 2020 Tokyo Olympics. 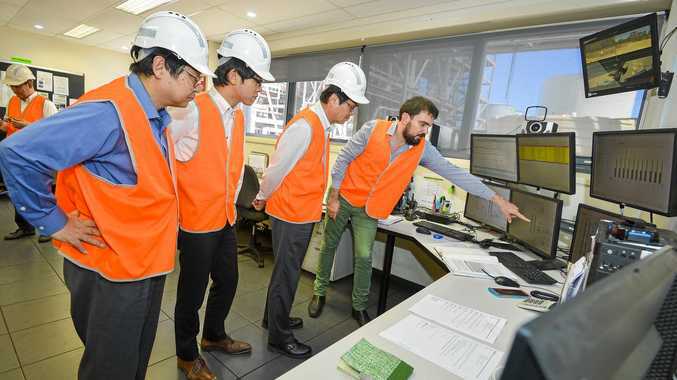 Tours of the Gladstone Ports Corporation and Northern Oil Advanced Biofuel Pilot Plant at Yarwun were at the top of their agenda as Japan prepares for a huge transition from fossil fuels. It was part of initial talks to export Northern Oil produced hydrogen - with technology created in conjunction with the CSIRO - from Gladstone to Japan. Hydrogen, described by Japan's Prime Minister, Shinzo Abe as the "ace in the hole for energy security" is expensive to produce, which is what Northern Oil hopes to change with its new plant. Mr Sugiyama said the attraction to Gladstone was prompted by the region's existing infrastructure and good sunlight. He said if Gladstone could become energy self-sufficient, it would be the perfect partner for Japan to import hydrogen and help the country transition from fossil fuels to renewable energy. "Today is my first time here and I'm quite convinced (Gladstone) has a great opportunity to help create a new energy system," Mr Sugiyama said. He said the work at Northern Oil to create cheaper hydrogen would make his dream of showcasing hydrogen in his home country possible. "My aim is to prove that hydrogen produced out of this renewable source here in Gladstone can be cost effective in the future. This is my dream," he said. "The primary purpose of our visit this time is ... so we, the Japanese community, can import hydrogen or solar driven green fuel from this region." The visitors, from Sumitomo Corporation, Sumitomo Seika, Sumitomo Electric and Tokyo University, learned more about Northern Oil's Project Ichiban - focused on creating cheaper hydrogen from waste crude oil. After building a prototype that gave "encouraging results" the company is preparing to build a robust, industrial-sized unit in partnership with the CSIRO and Gold Coast company Carbon Renewable Energy. The Yarwun refinery, which produces biofuel out of waste products, hopes to one day create enough bio-hydrogen to use for its own facility and export to places including Japan. Northern Oils director of corporate and regulatory affairs Troy Collings said it was "genuinely exciting" to be about nine months away from producing the product for commercial use at the Yarwun facility. "Hydrogen is an important, but expensive resource required for many manufacturing and industrial processes such as fertiliser production, edible oils and making margarine," he said. "We have the opportunity to produce cheap and reliable bio-hydrogen for ourselves and other industries. "This means we will be lowering our production costs as well as production costs for anyone that uses hydrogen in Queensland." Mr Collings said by using hydrogen to help produce its biofuel, it would cut costs by 70 per cent. He said it was "very exciting" to have leaders from multi-billion dollar Japanese companies show interest in technology and industries in Gladstone.